Denard Robinson has his worst outing of the year as Michigan falls to Michigan State; N.C. State knocks off Boston College. Michigan 17, Michigan State 34. Oh, the many things that went wrong in this game. The offense failed to run the ball effectively (that's Lloyd Carr parlance for "couldn't convert 3rd down and short"). Denard Robinson threw three bad interceptions. Receivers dropped passes; in one series, there were three drops in a row. As for the defense, they came out looking good, playing aggressive man-to-man coverage for the first time... but then they got gashed for huge plays as they got outmuscled on the line, failed to maintain their assignments, and took bad tackling angles. Pictures? Pictures. 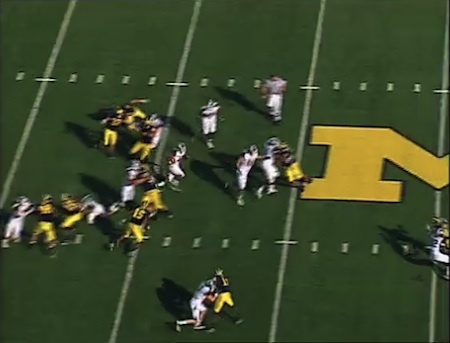 This is Michigan State's first big touchdown play. They line up in their twins right formation, with a fullback in the offset-I, and an unbalanced line (the tight end on the right side of the formation, not the left as he would normally be). Astute observers will note that the tight end is not an eligible receiver here; he's covered up by the outside wide receiver. This is an obvious running formation. 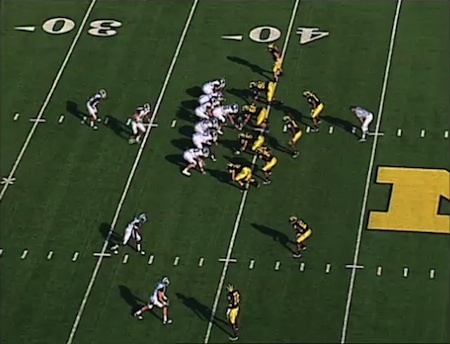 Michigan is in a 4-4 look, with eight players crowding the box and just one deep safety (off the screen). The defensive line is playing in two-gap techniques: the nose tackle, Mike Martin, is in zero-tech against the center and is responsible for covering both A gaps. 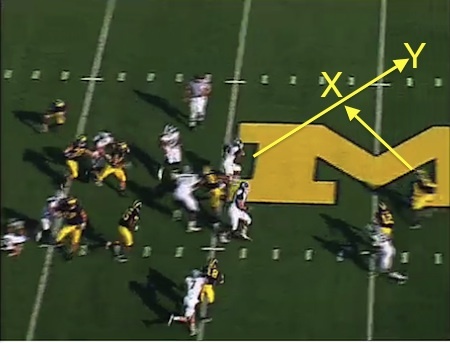 The other DTs are lined up over the OTs and are responsible for the B and C gaps. After the snap, the center and left guard do a combination block on Mike Martin: the center chips him and then heads out to block the linebacker, Jonas Mouton; the guard pulls around the center to get a better angle on Martin. This is a key component of the play. Michigan appears to have diagnosed the play and everyone is crashing in to to stop the run (except for the weakside outside linebacker, Jordan Kovacs, who has containment responsibility on the quarterback in case of a naked bootleg play). Defensively, Michigan looks to be in pretty good shape, with three linebackers ready to pounce in. Things start to break down a moment later. Thomas Gordon is going to crash in to attack the fullback and take away the off-tackle play; that's fine. Obi Ezeh is scraping to the outside to take away the sweep; that's also okay. But Mouton is getting crushed by the center and right tackle who have moved to the second level. And Adam Patterson (or is that Greg Banks ? whoever he is, I've circled him) is inexplicably facing sideways. I may not be a defensive line coach, but I'm guessing that if you're trying to cover two gaps on defense, it's probably not a good idea to be facing sideways. Edwin Baker, the Michigan State running back, sees the cutback lane open up behind the sideways-facing defensive lineman, who is still running sideways and getting ridden out of the play. Now Mike Martin still has a chance to close this down, but he gets momentarily held by the Michigan State guard. This is technically a holding penalty, but referees will call that perhaps one out of a hundred times, if they see it at all. Now the damage is done, and the result is that Baker has gotten to the secondary with just Mouton and the free safety to beat. Mouton is getting crushed by the center and right tackle. As for the free safety (Cameron Gordon), here's your lesson in tackling angles. Based on the direction you're facing, you seem to believe that you'll make the tackle at point X. However, given that you're currently standing still and Baker is running at full speed, by the time you make it to point X, Baker will have reached point Y. You have no chance of making a play; your only hope is to head for the end zone and try to run down Baker in a footrace. Gordon does not, in fact, come anywhere close to catching Baker. Touchdown Michigan State. 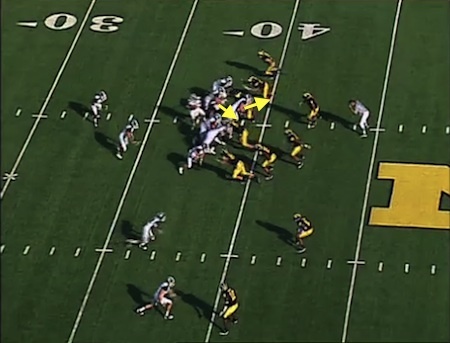 The Spartans would use variations of this play several times to great effect against Michigan's overpursuit. Iowa is next week, and they're coming off a bye. 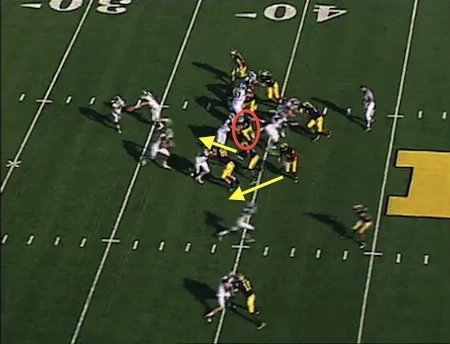 Michigan will need to bring its best game and find a way to crack the Hawkeyes' stout defense. Grades: Offense D, Defense C-. The offense looked awful. The offensive line failed to open up holes; Denard made a bunch of bad decisions; receivers dropped countless easy catches. On defense, the aggressive look paid dividends for a while, but it also left them vulnerable to big plays... and Michigan State took full advantage. N.C. State 44, Boston College 17. Boston College is having a pretty rough year; it's no surprise that N.C. State took care of them easily. A punt block return for a touchdown helped open the scoring floodgates; after that, it was all Russell Wilson, who went 38 for 51 and ended up with 328 yards passing on the day. Good thing, too, since State still hasn't found much of a running game. N.C. State plays at East Carolina next week. This is always a weird game for NCSU; ECU has given them trouble in the past even as a heavy underdog. Still, I'd be shocked if NCSU doesn't win by a comfortable margin. The big shocker of the day was #1 Alabama falling to #19 South Carolina, 35-21. Alabama out-gained South Carolina but failed to take advantage of opportunities in the red zone. #2 Ohio State crushed Indiana 38-10. This surprised me; with as good as Ben Chappell looked against Michigan, he only threw for 106 yards against Ohio State, and threw two interceptions. Was this just a bad day for Chappell, or is OSU's defense really that good? #8 Auburn barely survived a mediocre Kentucky team 37-34, winning on a field goal in the last seconds of the game. #9 Arizona was upset by Oregon State 29-27. Arizona was not as good as its 4-0 record suggested; I still see their Iowa win as a bit of a fluke. #12 LSU beat #14 Florida 33-29 in a wild mistake-filled game, throwing for the game winning touchdown with six seconds to play. Florida has three weak opponents over the next three weeks, but will have to contend with South Carolina and Florida State later in the season. Oh, and between those two games? Appalachian State, who is undefeated and, in a likelihood, hungry to knock off another giant. #13 Miami was crushed by #23 Florida State 45-17. Florida State is looking pretty scary these days: they got crushed by a good Oklahoma team in Week 2, but have been dominant in their other games. #16 Stanford beat USC 37-35 on a last-second field goal. USC is in danger of having a 6-6 season; they still have Oregon, Oregon State, Arizona, and Notre Dame left to play, and there's a good chance the players are starting to lose motivation. #21 Nevada continues their Cinderella season, beating San Jose State 35-13. #25 Missouri goes to 5-0, beating Colorado 26-0. I think Missouri is underrated this year; then again, they've been overrated plenty of times in their past, so voters are probably leery. Penn State is probably in full panic mode after losing to Illinois 33-13. They should be able to handle Minnesota next week, but their final five games are Michigan, Northwestern, Ohio State, Indiana, and Michigan State. All five teams are playing better than Penn State right now, and if Penn State doesn't pull itself together, they're looking at a 4-8 season. Northwestern, for its part, lost to a bad Purdue team 20-17, despite out-gaining them by 110 yards. I still think Northwestern is a dangerous team. North Carolina beat Clemson 21-16. Clemson is one of those teams that is perennially over-hyped, so it isn't a huge surprise that North Carolina and its rag-tag defense managed to beat them. UConn lost to Rutgers in heartbreaking fashion, 27-24. UConn led by seven going into the second half, but couldn't generate another score. Notre Dame beat Pitt 23-17. Pitt is just not very good. I wonder if the "Dave Wannstedt is a genius" thing is perhaps losing a bit of its credibility?